If you have lost several teeth, there are various treatment options available. One option involves the fabrication and placement of a partial denture. A partial denture sits over the gums with a framework that provides minor stability. The partial denture lacks a secure connection, and without tooth roots to stimulate the bone, the jawbone in that area will begin to shrink. The partial denture will then move and shift, because the shape of the jawbone has changed, causing the fitted denture to loosen. Over time, this movement will irritate the surrounding gums, causing pain and discomfort. Most patients are also not satisfied with this alternative due to the bulk of metal and acrylic and the unsightly clasps necessary to stabilize the prosthesis. 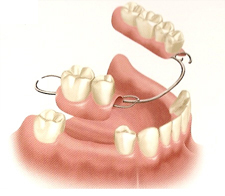 Today, there is no reason why you should opt for removable partial dentures. Instead, you should consider the state-of-the-art dental implants treatment. During this procedure, both the missing tooth root and the mission crown are restored with durable, biologically compatible materials. In addition, the growth of new bone is stimulated, and the adjacent teeth are strengthened. If you would like to learn more about receiving dental implants in New York / New Jersey, please contact our offices by phone or by filling out our form to schedule a free initial consultation. At Advanced Periodontics & Implant Dentistry, patients can choose from an array of leading-edge dental implant treatments. In addition, our highly trained dentists offer several advanced gum restoration and beautification procedures, including laser gum surgery and gummy smile correction. If you would like to speak with a skilled NYC / NY periodontist, please call our offices to schedule a consultation.